IronSocket is a VPN provider based in Hong Kong. Even though it’s a brand new, being launched in 2013, the team has almost 10 years experience in the industry. The company was originally known as HideMyNet and started building the foundation for its service and infrastructure since 2005. Even though they changed their name to IronSocket and gave a makeover to their image, they maintain their commitment to provide an effective and versatile solution to navigate the internet anonymously. With IronSocket, you will be able to enjoy access to any website without worrying about censorship or geo-location restrictions. The company has been working on the expansion of their network and aim to provide high technology and innovation. We’ll take a look at IronSocket’s main aspects and see if they offer a solid VPN solution for you. 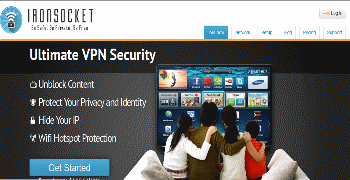 IronSocket supports the main VPN protocols such as L2T/IPsec, PPTP and OpenVPN. They also give customers access to HTTP, SOCKS5 and DNS Proxy, which is not a readily available option from many providers. A DNS proxy server is an ideal solution when you want to access websites or services that are not available in your region. With a DNS proxy, users can watch content from services like BBC, Netflix or Hulu, without routing all their traffic through a VPN. This will allow you to enjoy better speed and performance and is convenient when you want to continue using your usual connection for other sites. The fact that IronSocket offers this option as part of their plans, without additional cost, is one of the things that make them stand out. Keep in mind though that while convenient, a DNS proxy doesn’t offer the privacy and anonymity that you get from a VPN. If the security of your data is your main concern, it’s advisable that you stick to a protocol like OpenVPN. IronSocket does not offer custom software, which means that the installation process is a bit more complicated. However, they provide helpful guides to set up the service on a wide range of devices and operating systems. The instructions for Windows are simple.While other guides could do with a bit more of details, they are still easy to follow. IronSocket offers a good level of security with BF-CBC encryption and 1024 bit RSA key. This is a satisfactory level of protection for most users. Yet, when compared to other providers that offer a higher level of encryption and improved RSA key size, IronSocket is not the safest option available. For those concerned about the security of their data, IronSocket is an acceptable solution but it’s not the best. ronSocket works with Windows, OSX, Linux, Android, iOS and Blackberry. Every plan allows you to use the service in up to three devices at a time. They also offer a 7 day money back guarantee. They also have a useful guide to illustrate how and where sessions logs kept. For instance, there are no loggings in their Hong Kong server but in the UK servers and session logs are maintained for up to 30 days. IronSocket is committed to delete all data once the timeframe has expired and state that no information is monitored by them. While this may put off many users from subscribing to their service, at least they’re transparent about it. IronSocket counts with a selection of over 50+ servers across the world. You can access servers in 36 countries. This includes New Zealand, Sweden, Netherlands, Ireland, Panama, Argentina, Hong Kong, Cyprus, Egypt, Indonesia, United Kingdom, Germany, USA and Japan. This wide range of locations ensures that you can access the content you want, no matter where you are. You’ll always be able to find a server near you. In terms of speed, IronSocket has a solid performance that will allow you to stream media content without major delays. You can also enjoy internet browsing without any issues. In general, the servers in the network are fast and reliable and its easy to connect to them. That includes those that are further away from your location. Keep in mind that P2P is only available in certain locations. The list includes Thailand, Ukraine, Saudi Arabia, Romania, Brazil, Russia and Iceland. IronSocket’s website is simple and easy to navigate. You will find information about their services and a clear FAQ section. If you need to contact them, they will offer support through thr ticket system, which is available 24/7. While many customers would prefer to have more choices to get in touch with them (such as live chat), the support team is very fast and efficient to reply via ticket. You might usually receive a response within a few minutes, depending on the query. IronSocket offers a good set of basic features, as well as some that stand out like the DNS proxy. Other providers do not offer this option or charge extra for it, so that is a point in favor for IronSocket. They also have a good selection of servers, to ensure that their customers enjoy a great internet browsing experience. The company is open about its privacy policies and explain them clearly. That being said, the fact that there are some logs kept will be disappointing for privacy conscious users. IronSocket is said to be working to upgrade its technology. Hopefully they will offer a higher level of encryption and a custom software that will improve their customers’ experience. For now, they are still an option worth considering thanks to a solid service and a convenient price.